The lake is situated behind the Pentwyn Leisure Centre, Bryn Celyn Road within the public open space – Parc Coed-y-Nant, Pentwyn, Cardiff and shown for identification purposes on the accompanying plan. 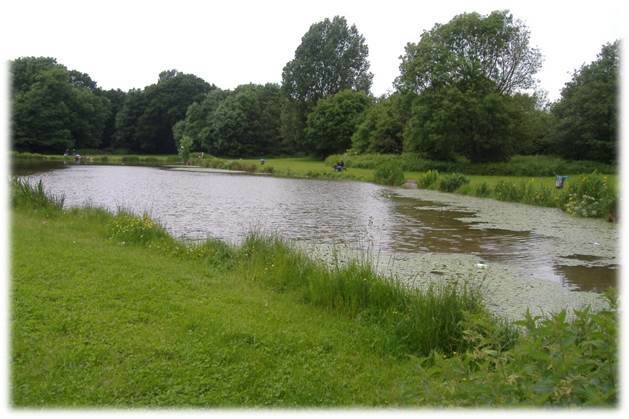 Parc Coed-y-Nant fishing lake (area c.4,745 sq. m.) was constructed as an ornamental lake in 1975 as part of the former Pentwyn Park Improvement proposals. The lake is triangular shaped formed by a timber dam across the tributary from the Nant Glandulais Stream course. The deepest section is approximately 1.2 metres close to the dam. Although shallow, the water supply is constant and fairly well oxygenated due to the constant flow and the presence of oxygenating pond weeds within the lake. The lake was originally provided with a butyl liner but this has since been perforated in a number of sections as a result of past de-silting operations. Despite this, the clay substratum is fairly impervious and the lake levels remain constant. The main stream course has a weir constructed to facilitate a constant flow.